Omnilert's Shibboleth/SAML connector can provide your subscribers with a simple, unified way to log into the Omnilert Subscriber Portal. This setup will allow Subscribers to access Omnilert using Okta login credentials. This guide will walk you through the process of adding and configuring Okta for use with Omnilert. This setup requires Omnilert's Shibboleth/SAML connector. If the Settings >> Single Sign-On >> Shibboleth / SAML menu is not present in your account, please contact your account manager to have Shibboleth/SAML added to the account. If you have this feature already, skip to step 2! This setup will require your Okta system's "metadata" to be imported by Omnilert's team. Sign into your Okta administrative account and download your Okta metadata. 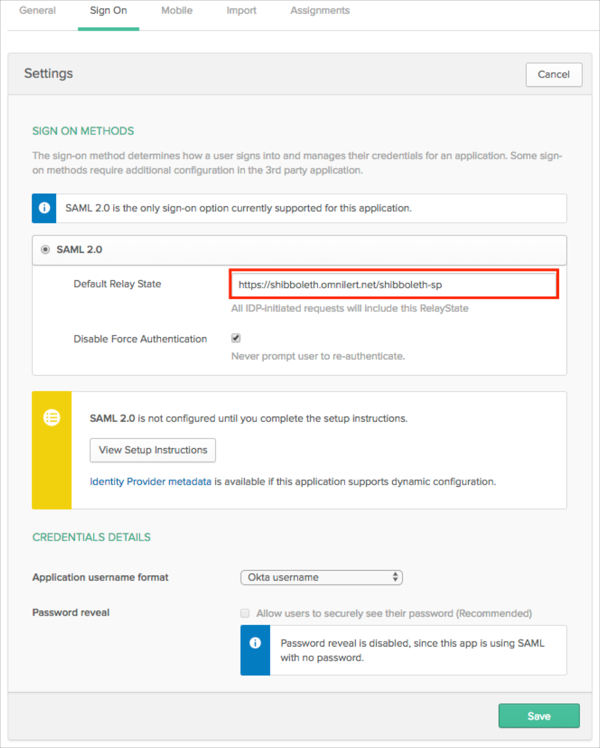 In the Settings >> Single Sign-On >> Shibboleth/SAML configuration, enter the "Entity ID" and "Logout URL" values provided by Okta. Once entered, click Update settings and Omnilert will create the "Shibboleth page link" and "Check attributes link" values automatically. In Okta, select the Sign On tab for the Omnilert app, then click Edit. Once complete, your subscribers will log into Omnilert by using the "Shibboleth page link". That URL is provided in the Settings >> Single Sign-On >> Shibboleth/SAML configuration. Simply share that URL out to your subscribers, as a link on your website, a graphical link, a tweet, a menu item in your web portal, etc. When someone clicks that link, they're taken into Omnilert's subscriber portal via the Okta login system. *Note: Omnilert 6 or later is required for this Okta SAML connector.